This is the ultimate guide to Japanese tableware and table set-up. 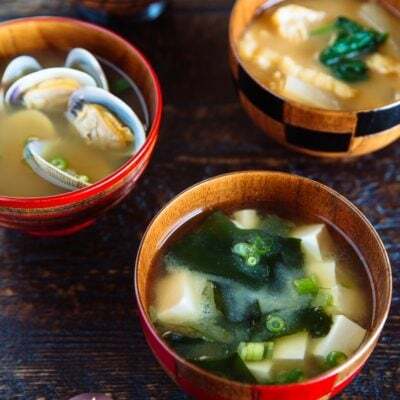 You’ll learn about the important components (what bowls and plates to use, their sizes & functions), and table arrangement on how to set up a Japanese meal. 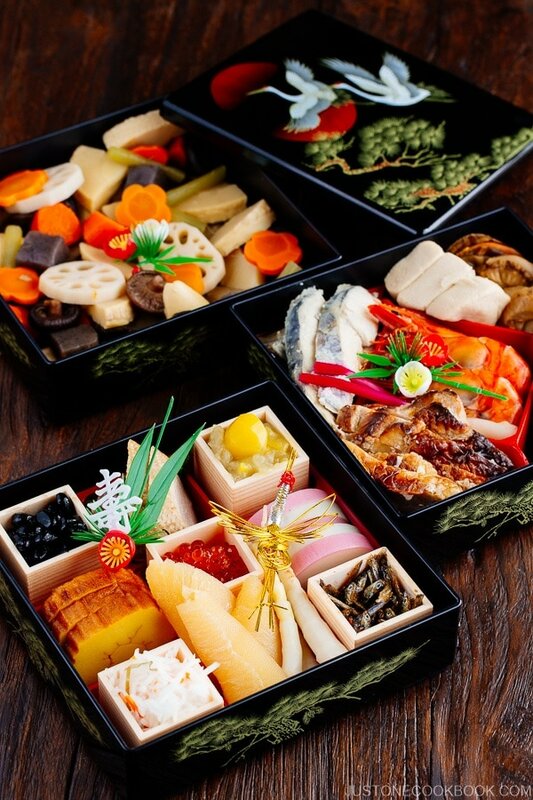 Are you interested in serving the Japanese meal (or known as Washoku 和食) in a traditional Japanese setting? Imagine re-creating the dining experience you’ve had from your memorable ryokan stay from your very own home? 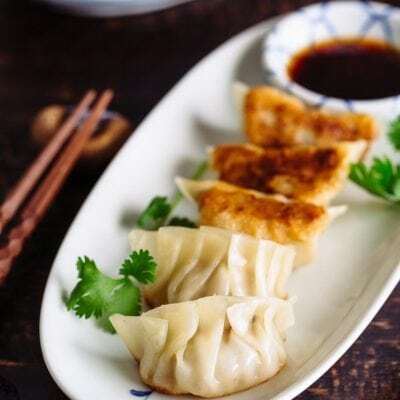 In this post, I’ll show you exactly what you will need for tableware to present a typical Japanese meal. I also included the measurements so you can find similar-size western plates and bowls if you have to use them. Trust me, everyone can pull off a Japanese-style table setting with ease and confidence. Let’s get to it! The most “personal” element among the Japanese tableware is the rice bowl. In Japan, each family member may have their own personal rice bowl dish with different sizes and materials. 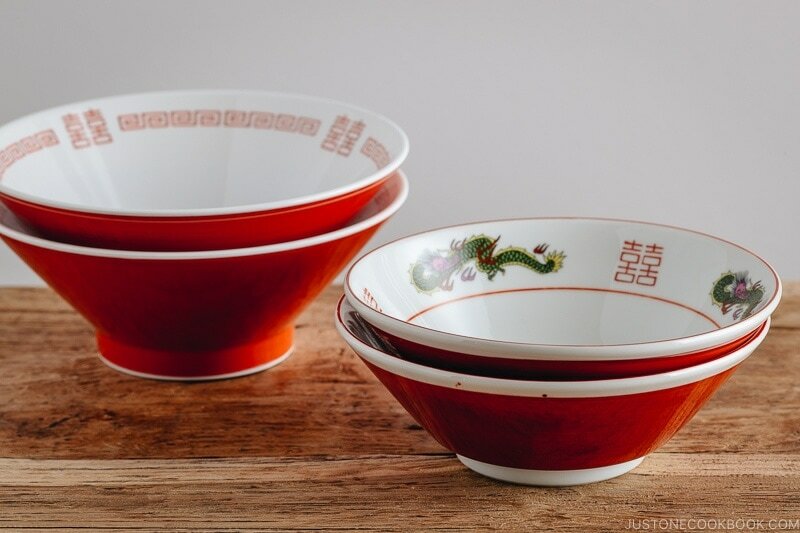 Dad may get a big ceramic rice bowl, mom may use a porcelain rice bowl with sakura pattern, the daughter may use a modern cat design rice bowl, and the son may use a character print on the rice bowl. There is a couple rice bowl set called Meoto Chawan (夫婦茶碗). The husband gets the big bowl and the wife gets the smaller bowl. 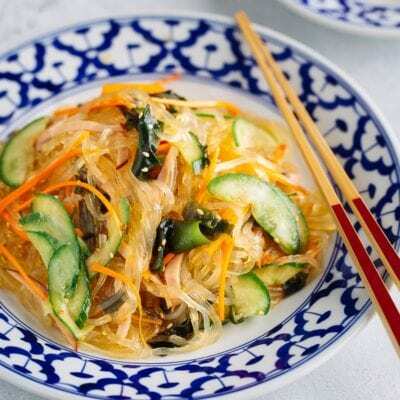 There are also rice bowls for children, while toddlers use plastic rice bowls (yes, Japanese toddlers can be picky and temperamental during mealtime too). The concept here is about customization for personal liking, which I think makes the dining fun and intimate. 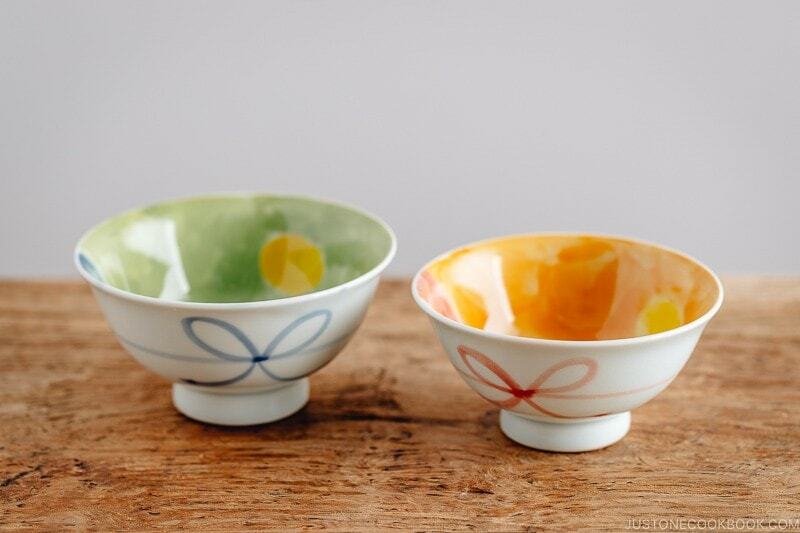 Since Japanese cuisine focuses on seasonality, you may change up the bowls based on the seasons. 12 cm/4.7″ (4寸) in diameter, 6 cm/2.4″ in height, contains 150 g/5.3 oz of steamed rice. 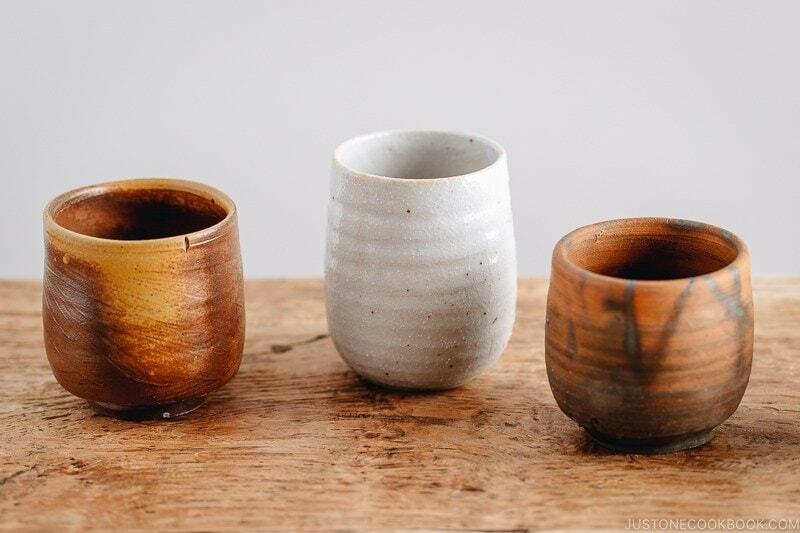 Since shiruwan or owan is used to serve hot soup, it is often made with the wooden material. Unlike rice bowls, everyone in the family typically uses the same type. On a special day or holiday, soup is served in a shiruwan/owan with a lid. It is usually lacquered and has beautiful designs such as flowers. 12 cm/4.7″ (4寸) in diameter, 6 cm/2.4″ in height, contains 220-280 ml/roughly 1 cup of liquid. This plate is mainly used to serve the main dish (主菜). 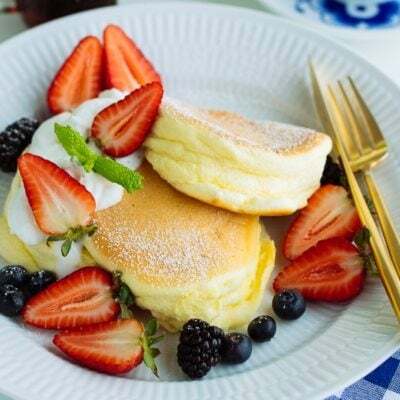 When you have a table with big serving plates and bowls in the middle, these medium plates can be used as an individual plate. When used in a non-typical Ichiju Sansai setting, you can use this medium plate for a toast, etc. This plate is very helpful so it’s nice to have variations of designs, shapes, and materials for different seasons and table settings. 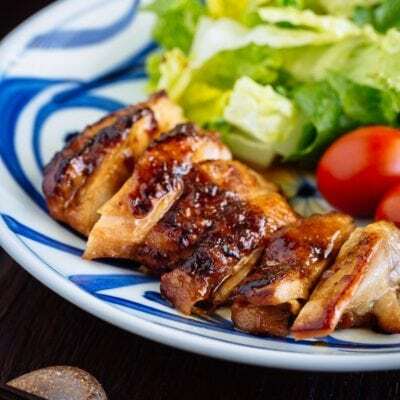 21 cm/8.3″ (7寸皿) – A perfect dish for Ichiju Sansai’s main dish. A serving plate for a la carte. 18 cm/7″ (6寸皿) – A dish to fit Shokupan (Japanese pullman loaf). 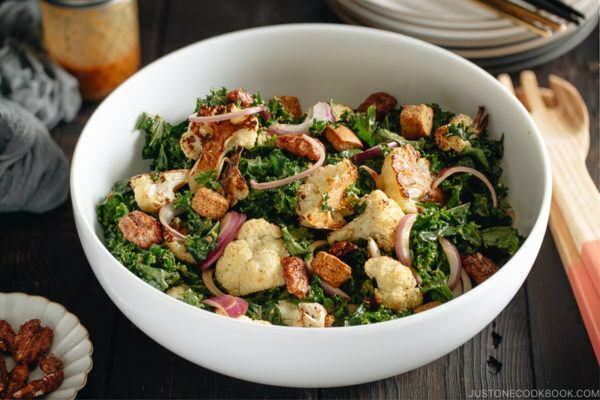 Good size for single serving salad and side dish. 30 cm/11.8″ (10寸皿・尺寸皿) – A serving platter for a big party, sashimi platter. 27 cm/10.6″ (9寸皿) – A serving platter for 4, great for plating ingredients for hot pot. 24 cm/9.4″ (8寸皿) – A one-plate dish for pasta and curry. 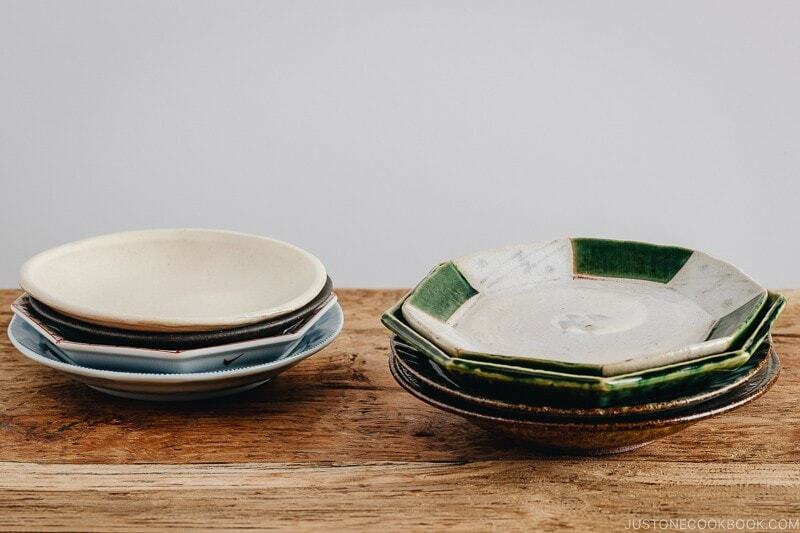 These small plates are perfect for side dishes, desserts, and snacks, or you can use them as an extra plate to share. Smaller plates can be used as an accent for the table setting. Have fun collecting different colors and shapes to spice up your table. 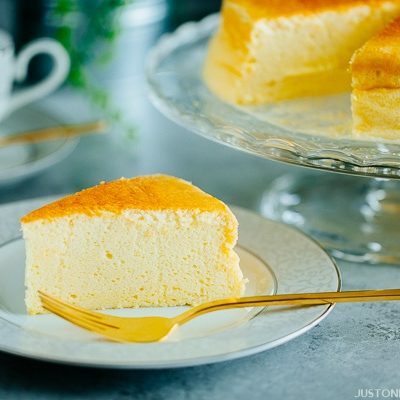 15 cm/5.9″ (5寸皿) – Goof size for an extra plate to share or a slice of cake. 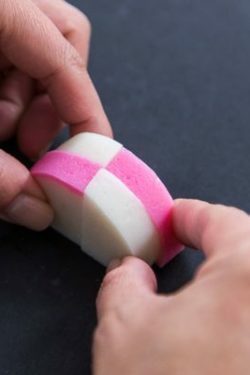 12 cm/4.7″ (4寸皿) – Good for small dishes like Cold Tofu, pickles, and Japanese sweets (wagashi). Mame-zara is used for soy sauce for sashimi, spice/condiments, or garnish (green onion, grated ginger) for Cold Soba, or small ingredient. 9 cm/3.5″ (3寸皿) – Good for bite-size dishes or condiments like soy sauce. 6 cm/2.4″ (2寸皿) – Good size for putting a garnish. It can be used as a chopstick rest. Kobachi is a small bowl normally used to hold Sunomono (vinegared salad), Aemono (dressed dish), Nimono (simmered dish), or Chinmi (special delicacies). 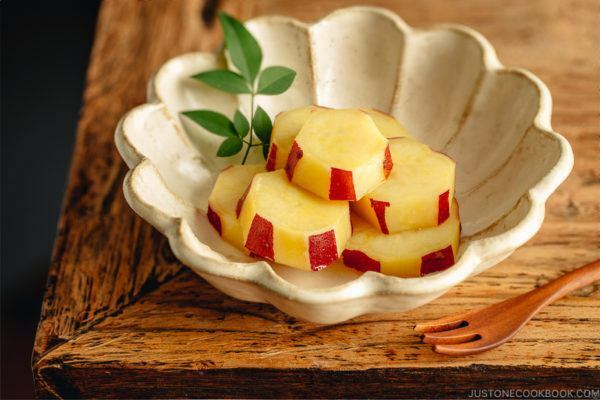 It also can be used as an individual dish for hot pot. There is no “specific” size for kobachi bowls, but there are three rough sizes listed here. Size for Small Kobachi: Roughly 12 cm/4.7″ in diameter. 15 cm/5.9″ (5寸) in diameter (Medium Bowl, 中鉢) – Perfect for a two-serving main dish (with soup/sauce) or single-serving soup and donburi dish. Roughly 22 cm/8.7″(7寸) in diameter (Big Bowl, 大鉢) – Perfect for a four-serving main dish (with soup/sauce) or single-serving noodle soup dish. 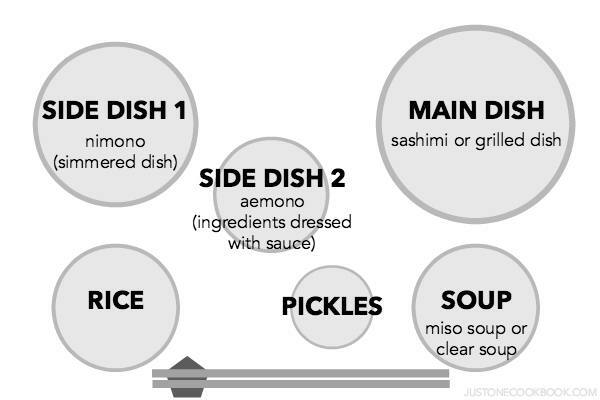 Before setting up the table, it is helpful to understand the elements of a Japanese meal. 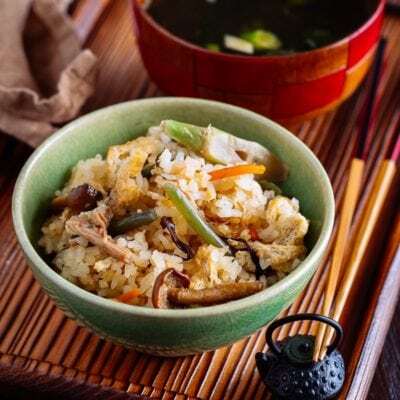 Known as the Ichiju Sansai, a typical Japanese meal at home involves one rice with several side dishes and a soup. I included a more in-depth article on Ichiju Sansai for your reference. The location of each dish is set for Ichiju Sansai: Steamed rice on the left front, and soup on the right front. Then the main dish is behind the soup, and side dish 1 is behind the steamed rice. Side dish 2 and pickles are located in the middle space. When you serve a meal in Japanese table setting, chopsticks and chopstick rests (hashioki) are a must-item. 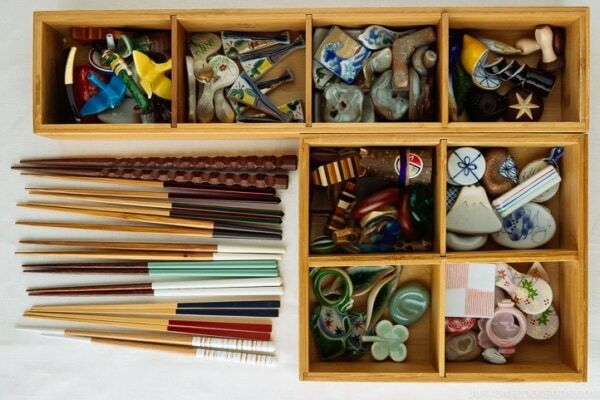 You may ask if chopstick rests are necessary. Well, chopstick rests are there for hygiene reason so the used chopsticks don’t touch the table. Plus, don’t you think they add a nice accent to the setting? 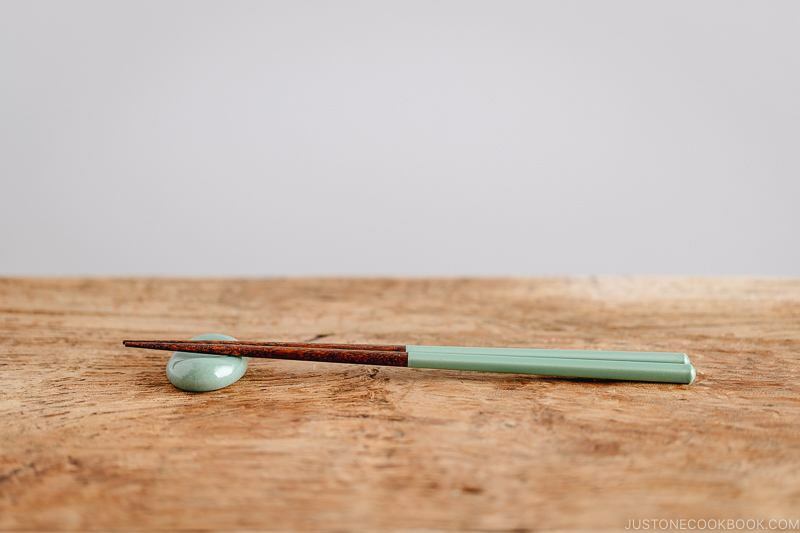 There are so many designs for chopsticks and chopstick rests, and it’s fun to collect them so you switch them up for different seasons and occasions. A large bowl used for soba or udon noodle soup as well as rice bowl (donburi) dish. Size: 15 cm/5.9″ in diameter, 8.5 cm/3.3″ in height contains 900 ml. A large bowl used for ramen. Size: 18 cm/7″ in diameter, 9.5 cm/3.1″ in height, contains 1400 ml. For Ramen Bowls, check out these online shops like MTC Kitchen or MIYA Japanese Tableware and Gifts. A tube-shaped dish used for soba dipping sauce and small dishes. Size: 8 cm/3.1″ in diameter, 7 cm/2.8″ in height, contains 180-200 ml. A cup designed for steaming, and comes with a lid. It’s used for dishes like chawanmushi. Size: 8 cm/3.1″ in diameter, 8.5 cm/3.3″ in height, contains 200-230 ml. A cup used for Japanese green tea. Size: The size varies depending on the occasion. Japanese tableware comes in various sizes and shapes, but they are guided by these measurements to create a well-balanced meal. The measurement unit sun (寸) is used for Japanese tableware and it was introduced in the ancient history of Japan derived from measurements and proportions of the human body, collectively known as “Shindoshaku” (身度尺). 1.Mix & Match – When comes to table set up, you don’t have to follow the strict rule of using only Japanese designed tableware. Some of the western-style plates and bowls can work to complement the table. Consider white or earth tones when choosing your colors. Handmade ceramic bowls and plates by your local artisans make an excellent choice too. You may be able to pick out designs that are very similar to Japanese tableware or in symmetry with Japanese elements. 2. Think harmony – In addition to colors, shapes, and textures, you will learn that the Japanese dining aesthetic places an emphasis on harmony. Which is what washoku 和食 all about. Everything has a place and purpose. 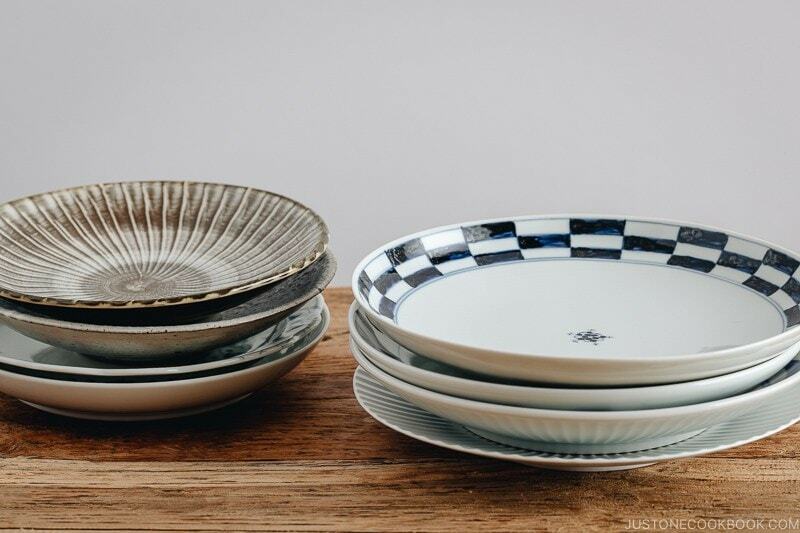 When selecting your tableware, you don’t have to look for overly ornated choices but work on creating a balance to guide your artistic arrangement. 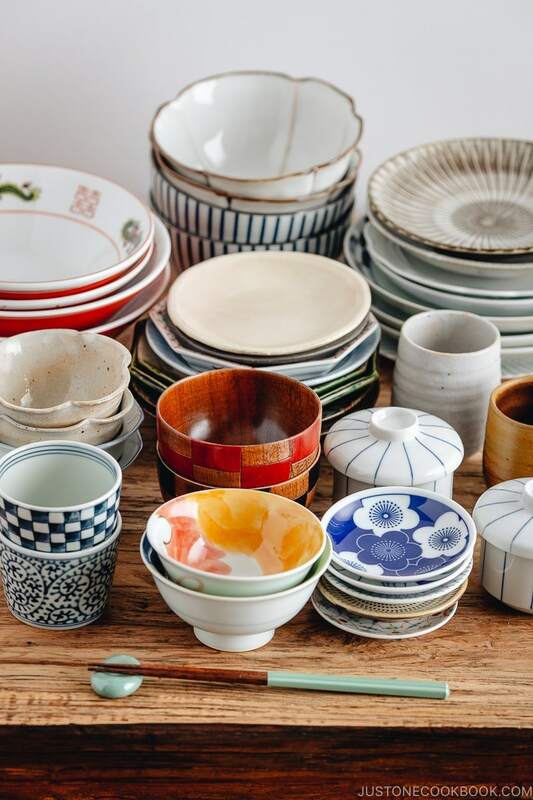 Where to Find Japanese Tableware outside of Japan? Daiso and Muji are two major international Japanese stores that carry a wide selection of kitchen and dining items at affordable prices. If you are in the US, you can also look up World Market, cb2, Crate & Barrel or Etsy for Japanese-designed bowls and plates. If you have the opportunity to visit Japan, check out my article on 10 Cookware & Tableware You Should Get from Japan. With this, I hope you’re inspired to do a Japanese table set-up the next time you prepare a Japanese meal at home. 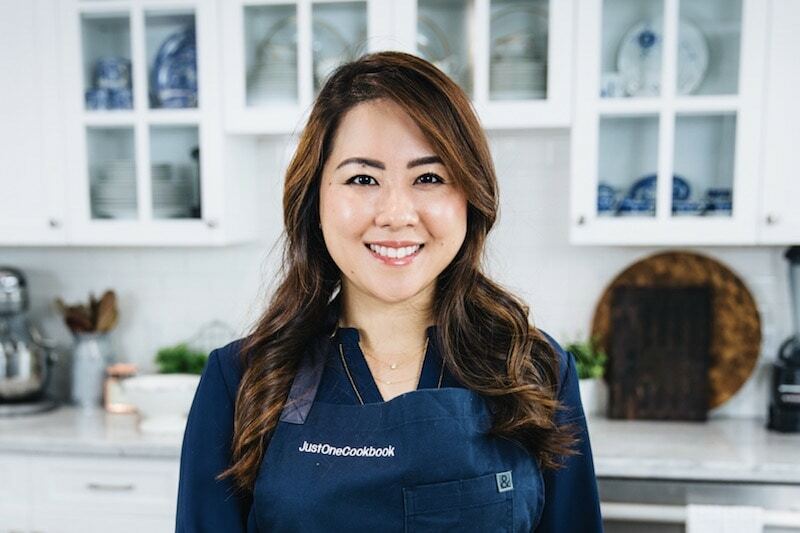 And if you do, don’t forget to snap a picture and share it with #justonecookbook on Instagram. I’d love to see them! 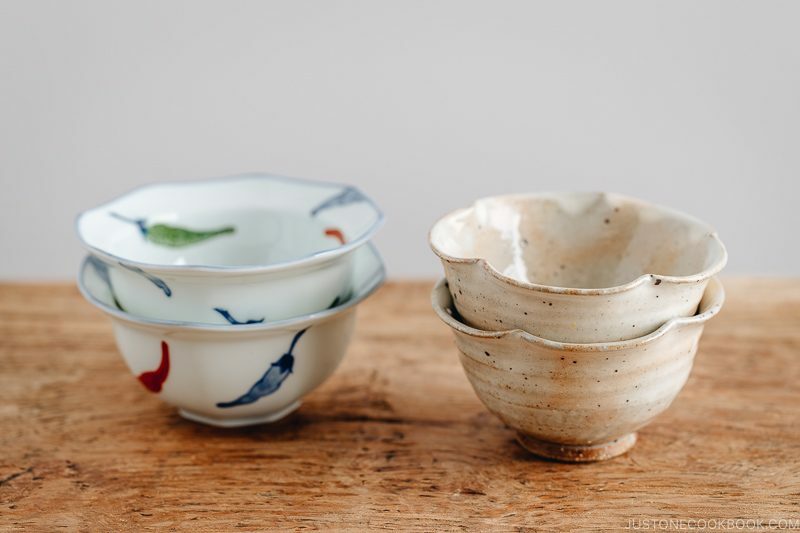 Also, if you know where to find gorgeous Japanese tableware in your local area, share it with us in the comments below. 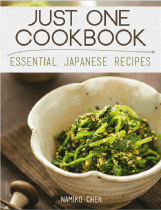 Starting to build your kitchen for Japanese cooking? Here is my recommendation of the kitchen essentials. I’m very happy to see this post! I’m not sure if I may have encouraged you to make it with a comment I made a couple of months ago in another post (I’d be very glad if so! ), but your post perfectly matches something I was looking for for a while! It’s a pleasure to read and see the beautiful images! I’m saving this for future reference and also for when I go to the Liberdade (Freedom) neighborhood here in São Paulo, Brazil, to shop for Japanese tableware! Thank you so much for this guide! I have a question. If you have a small dish for dipping sauce, where does it go in ichiju-sansai, relative to the other dishes in your illustration? Also, this was very educational. 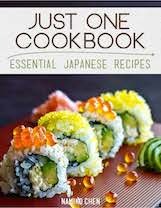 I am very happy to have learned the real purpose of many of the Japanese dishes I’ve bought. It was cool to learn that many people have their own personal rice bowls that they use at each meal. I like that! I know this is not easy to get in the US, but whenever I go to Japan I buy this set and bring home (dishwasher safe too). It’s SO easy to use and it’s been my favorite chopsticks for daily use. I found these at Tonkatsu Wako restaurant (selling at the counter where we pay) many years ago and I’ve been updating our sets every time I go back to Japan. 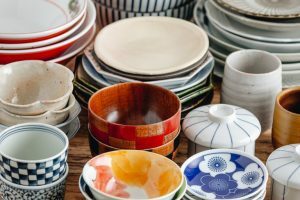 Thank you so much for this very helpful article on Japanese tableware. Knowing the dimensions of the dishes makes it much easier to find them in the appropriate sizes. I read with interest your article on Japanese tableware and table-setting. Now, I know how to use the different dishes I bought every time I went home to Tokyo for a visit. They are so pretty and add color to the table; and, for me, Japanese food tastes so much better eating out of them. I remember the pleasant dinners I had with friends in charming ryokan and onsen in the beautiful countryside. I also enjoyed your colorful pictures with the explanation for the different dishes and bowls. I look forward to your recipes and interesting articles, and I thank you. Hi Runy! Thanks so much for reading this post and for your sweet feedback on my blog. I’m happy to hear you enjoy it. 🙂 I agree, the Japanese dining is about the whole experience, and it starts from the dishware choices and environment. 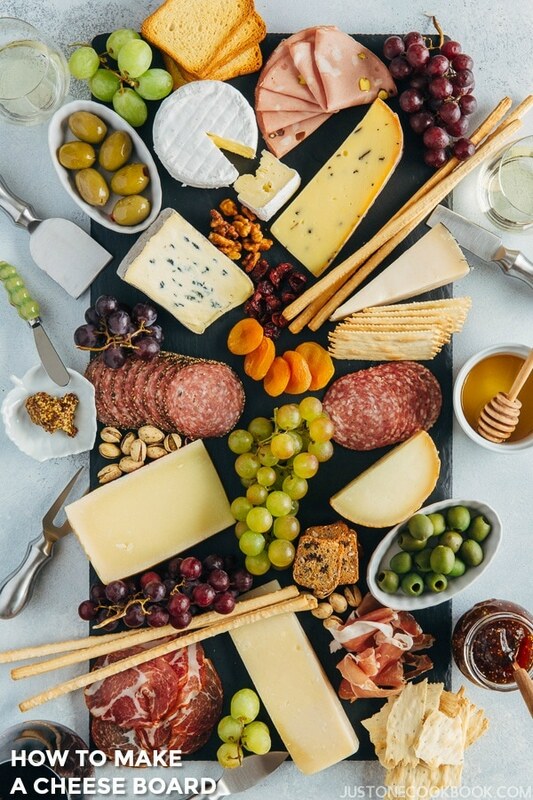 Maybe it’s a bit too much for day-to-day eating, but it’s fun to set up a nice thoughtful meal once in a while incorporating all the aspects for dining experience. Very interesting information. Thank you! I’m back from vacation, and happy to see this post. 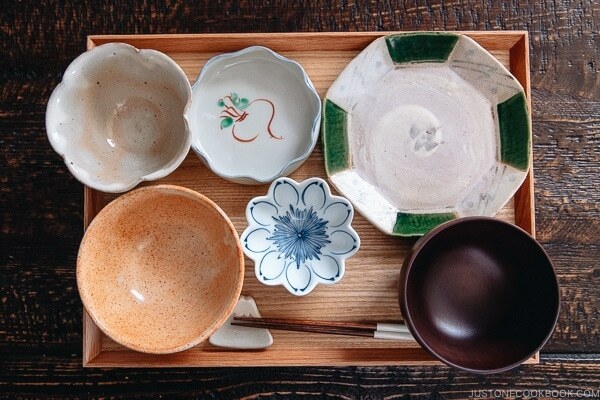 Really wonderful info — had no idea about the hows and whys of Japanese table settings. 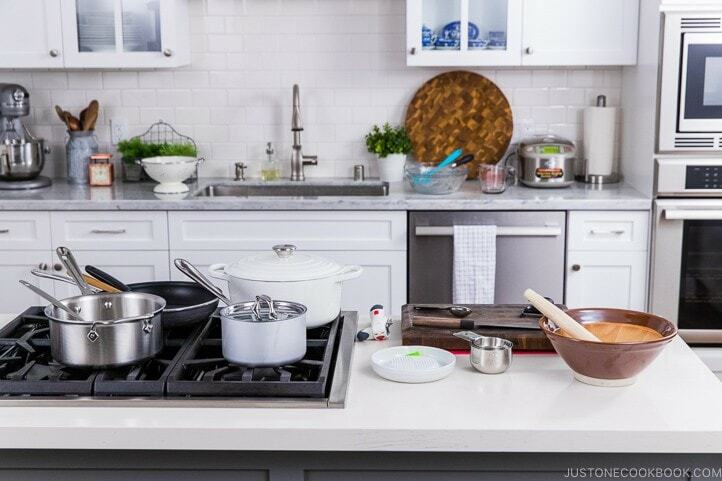 Love those small dishes! The designs are really neat,. Thanks! New Orleans has a market across the river in Kenner/Algiers called Hong Kong Market. They have very nice china dishes of all sizes. Also woks, kettles, etc. Fresh produce brought in daily. We get daikon, burdock, Chinese eggplant there. Prices on tofu and miso are very good. It is on Behrman off General deGaulle. An easy find with lots of parking. Hi Barbara! I’m happy to hear you have a good Asian market to shop at! My neighbor just came back from a vacation in New Orleans and they said they ate so much every day! I would love to visit one day… Thanks for sharing about the shop! Hi Gem! Ahhh! It took me a while to write this post (requested by readers around Sept) and I had a crazy website update/fixing which ended up posting this post very late. So sorry! But it’s not just you who get overwhelmed by going to Kappabashi… I usually can’t think either after stopping by at one shop. I have some favorites so that’s where I usually shop and focus. 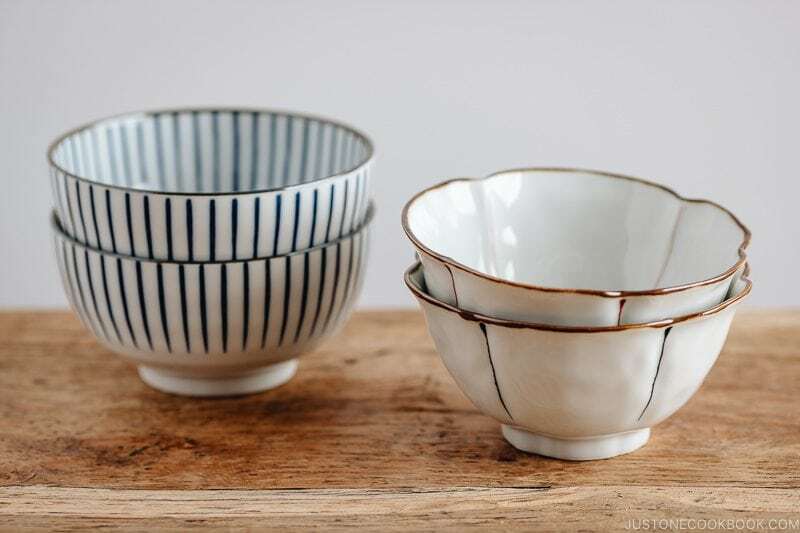 Enjoyed your post on Japanese tableware! Very interesting. This guide is wonderful! And the info on different dish sizes is so helpful for finding suitable western tableware that works for presentation! I was wondering, you often show meals displayed on a tray. What are the approximate dimensions and what qualities do you look for in trays specific to presenting ichiju sansai? Do you mean the round one that I sometimes share on IG or this post? Mine is from Muji. It’s small so you can’t put all the plates and bowls for Ichiju Sansai on this one, but maybe 3-4 small plates/bowls. US website doesn’t have one currently, but I saw it at the SF store not too long ago. The whole Ichiju Sansai can fit on a rectangular one, which was also in SF store, but not on the site now… but here’s one from Japanese site. There are lacquer trays etc but I like these natural wood ones. Dimension mentioned in the website in cm. Thank you for this post! 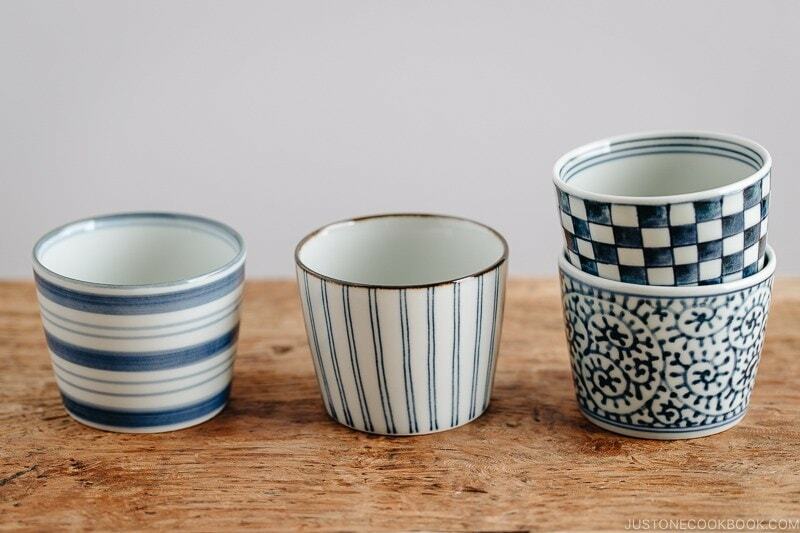 I’ve been slowly stocking my cupboards with Japanese tableware ever since I stumbled across this blog back in 2013. It’s great to have everything referenced here so I can see what piece I’m missing. The Uwajimaya grocery stores in the Seattle area all carry an assortment of Japanese dishes and tableware. Most of them are imported, but the costs are fairly comparable to the higher end dishes you’d find at a specialty cookware store. I’ve never had a chance to visit Uwajimaya, but I heard they do have a nice collection, along with well-stock Japanese ingredients. One of these days I hope I can visit to check it out. It’s nice to hear their price for tableware is reasonable too! Thank you so much for writing, Ron! Thanks for this wonderful post! For several years I have have been making bento box lunches for my children’s lunches on occasion. I stumbled on your site in search of new bento recipes. They are teenagers now and are still thrilled whenever I pack a bento for their lunch. I also love shopping in a wonderful store Here iin San Jose that sells all types of Japanese tableware and cookware. 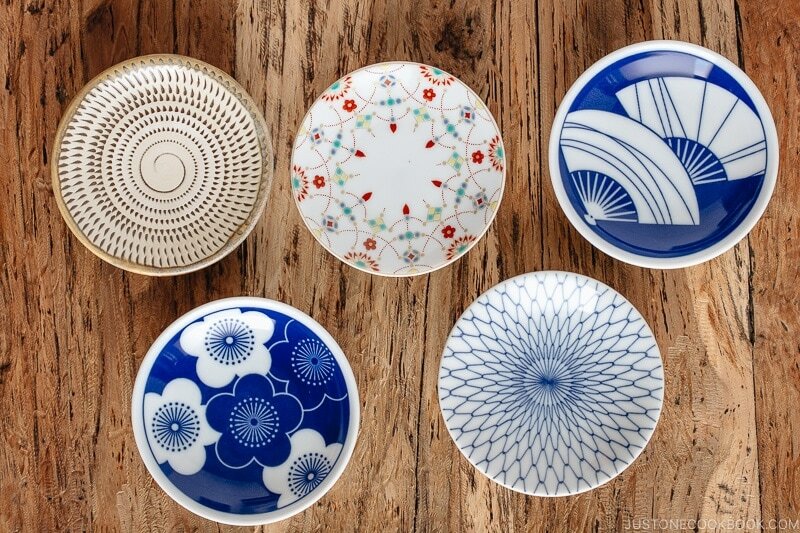 The different colors, tectures and shapes of the plates and bowls are fascinating and I have been very curious about how to set a japanese table. Now I know! Thank you. Hi Christine! Thank you for reading this post! I’m happy to hear you found my site when you were searching bento recipes. Your teenagers are so lucky to have you, preparing delicious meals for their lunch. Great job! Where in San Jose do you shop? Mitsuwa or individual tableware store? Nami, the shop is on Jackson street, in San Jose’s little Japantown. It’s called Kogura Company. They have a nice selection of tableware at good prices. I love browsing the aisles. I’ve made many fun purchases. They also have a god selection of vases and supplies for flower arranging. Hi Christine! Thanks so much for letting me know! Kogura – I’ll remember! 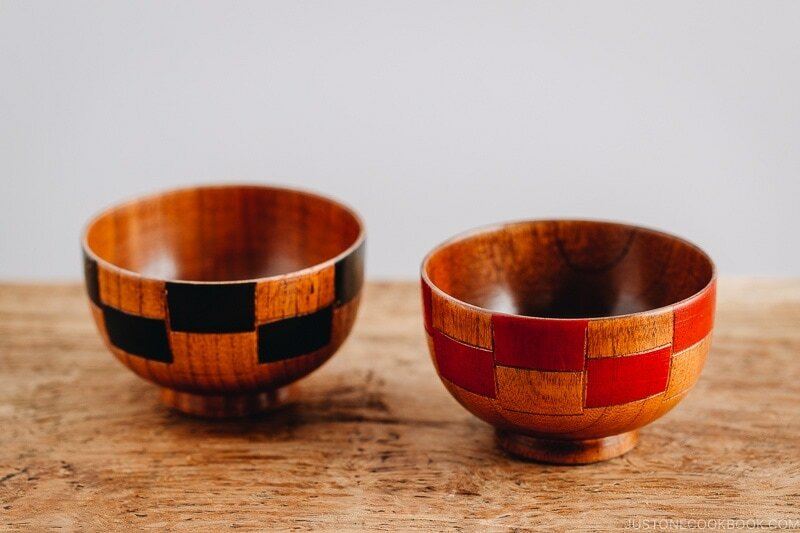 Wow, I would love to have those beautiful checkered wooden soup bowls! Where did you find them? Amazing post as always. 🙂 Thank you! 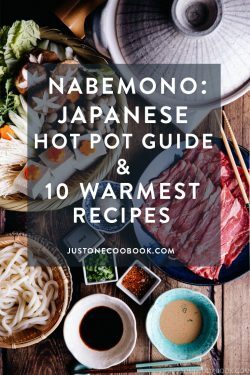 Where can I buy the pretty white, black and red bowls used in the Instant Pot Kuromame video? Thanks! Hi Lisa! White/blue one is from Japan (I purchased it from Takashimaya department store – roughly $20 or so). The red square bowls are from Daiso (Japanese dollar store, it was probably $3-4 each). 1. Sanko Kitchen Essentials – This store in Japantown used to have shelves of typical Japanese cooking utensils and serving bowls. However it recently changed ownership and the quality has increased dramatically! They now carry a mix between high quality Japanese tableware and local artist creations (bowls, plates, etc). Sanko’s selection reminds me most of Loft or Tokyu Hands. 2. Kamei Restaurant Supply – Kamei has a mind-boggling selection of asian plates, bowls, spoons at great prices. I’ve seen some of the same selection in Kamei as I’ve seen in Kappabashi. The tableware sold here is mass produced. 3. Soko Hardware & Daikoku by Shiki Inc – Both are in Japantown and both carry Japanese Tableware. 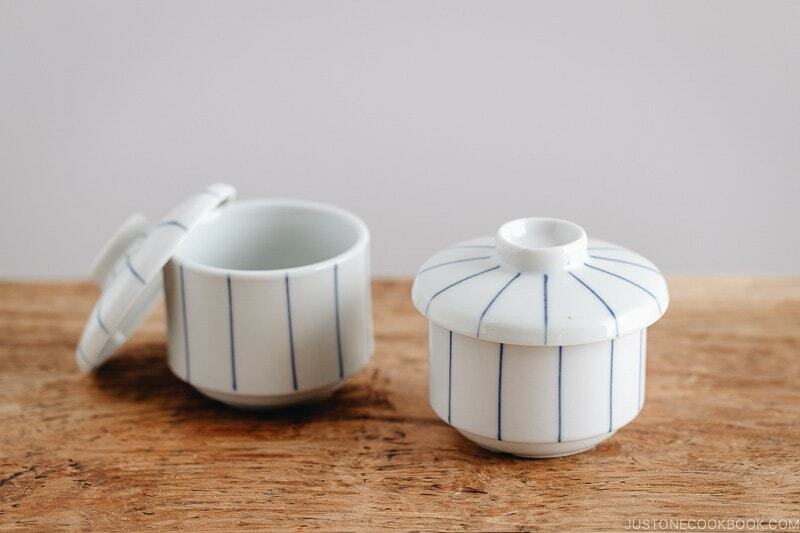 Daikoku by Shiki Inc’s tableware section is larger, but they’re both the visit. I suspect that the inventory at Soko, Daikoku, and Kamei all come from the same distributors. 4. There’s a really impressive tableware section in the large Daiso in Japantown. The inventory rotates, so it’s good to check there often. I love Daiso. 6. Although not explicitly Japanese, “MM Clay” in San Francisco is worth. It’s on the expensive side. Hi Bret! Thanks so much for sharing the SUPER DETAILED information with us! I’m sure local JOC readers will be happy to see this list! I’ve been to 1-4 but never visited MM Clay before (but seen their work in restaurants) so I should check it out! Thank you again, Bret! I’m trying to figure out what the woven sedge grass preparation plates that the Japanese use are called. I’m trying to do a price comparison between Kappabashi and Amazon but don’t know what to search for on Amazon. Hi Angelo! What’s sedge grass? I tried to find Japanese translation but can’t find it. I also searched for woven kitchen goods but I am not sure what you’re talking about – it’s not woven bamboo, right? You mentioned “plates”… what is served on? I think it may be bamboo. Its the plates you use during food preparation to put the chopped vegetables on. I read “O Fune Sama” and he described their hats as being made of sedge grass so I thought it might be the same thing. They look similar to those you used in your shabu-shabu video. Hi Angelo! Then it’s bamboo. 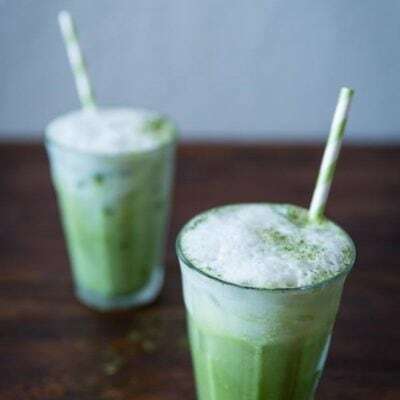 There are many bamboo products, so it may not look like the bamboo products that look familiar, but most of woven kitchen products are made of bamboo. Ohhh those hats are made of “wara 藁” and maybe that’s sadge grass? You’re right, they are bamboo and they’re called “Zaru” as well, which is basket as you’ve pointed out in the zaru soba recipe. Bizarrely, Amazon Japan’s English version has the translation as “monkey” which they got from “Saru”. Weird but funny. When purchasing, is it normal to buy enough for 4 or 6 or a dozen?